If you live in apartments in cities, you know how much your renting payment goes each month. The good news is that there is a problem, there is a solution. Look at this CityHome idea from the leading innovative power on this planet. 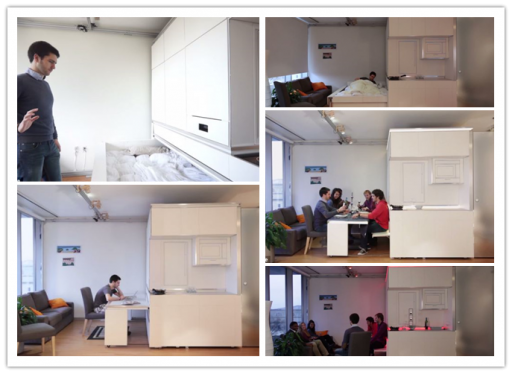 This incredible shape changing cabinet furniture from MIT media lab is claimed to triple the size of your 200 square feet apartment. This movable cabinet unit can change its shape with just a hand gesture. With just real hand waving, you can transform the furniture into a bed, dinning table, home office, kitchen, living room, and more. Amazingly inspirational, right? Check out the demo and let us know what you think! One Response to "Triple the size of your apartment with MIT media lab CityHome"